AND MAKE YOUR MARK ON THE WORLD? THE ULTIMATE GUIDE TO THE ULTIMATE YOU’! Ever since Superman debuted on the opening pages of Action Comics #1 in 1938, our culture has been collectively hooked on the latest adventures of our favorite superheroes in every media that’s come along—comic books, TV, film and video games. In 2011, as some 130,000 fans converged on San Diego’s Comic-Con, Thor, Captain America and The X-Men were holding court in movie theaters and raking in millions. After releasing three successful Spiderman films starring Tobey Maguire over the past decade, Sony is rebooting the franchise with a new director and cast in 2012. Clearly the world is SuperHero crazy—and with the current state of the economy and other major global crises, we need them more than ever. Enter Sage Michael. He looks like the mild-mannered, perhaps cool, man-about-town, but having run the gamut of ex-military, ex-bounty hunter, and current high-powered business consultant—is actually in the business of building real life SuperHeroes. 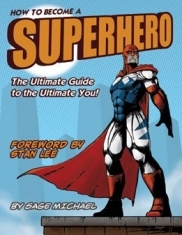 According to Michael’s cleverly written, revolutionary new book “How to Become a SuperHero: The Ultimate Guide to the Ultimate You!” (www.thesuperherobook.com), we don’t need to be from Krypton, get bitten by a radioactive spider or drive a Batmobile and wear a cape. We’ve all got the potential inside us to change our lives and the lives of those around us. Appropriately enough, the foreword for “How To Become A Superhero” was written by Stan Lee, former president and chairman of Marvel Comics who co-created some of the SuperHero world’s top icons—including Spiderman, Iron Man, The Hulk, Fantastic Four and X-Men. Lee calls Michael’s work “undoubtedly the right book for the right time.” “As you read it,” he writes, “you may not be able to leap over a skyscraper with a single bound but, guided by Sage Michael’s compelling and thought provoking text, it may make you feel like a SuperHero by showing you how to do the best you can, how to be the best you can, and how to serve as a role model for others, as every SuperHero should. Even before its official publication, the book—which is full of recognizable SuperHero references throughout, including chapter subheads like “How To Build The Batmobile” and “Choosing Your Kryptonite”—is receiving high praise from numerous high profile readers. One critic pegged its relevance to the current zeitgeist perfectly by writing “This is the Harry Potterization of the Self-Help genre.” In fact, one CEO bought 12 copies and has made it required reading for his Board of Directors. Nine-time NBA All-Star and former coach Lenny Wilkens called it the best book he’s ever read. It’s also been praised by people from all types of professions, from doctors and lawyers to graduates of the Secret Service Academy. While the concepts in “How To Become A Superhero” are meant to be universal, Michael’s original goal in writing it was more personal and based on the experiences of what he terms a dysfunctional childhood. He began writing it as part of an event called National Novel Writing Month, in which participants are supposed to pen a 50,000 word novel in 30 days. Soon it became obvious he wasn’t writing fiction, but a heartfelt and witty self-help book. “I was reaching back to save the kid that I had been while growing up,” he says, “as if I was telling that kid there is still hope for you—let me lay out a plan. I achieved that with a mix of idealism, strong values and super-heroism, expressing these thoughts in simple, colorful ways that little kid would understand. I was always looking for that hero, but growing up with the kind of upbringing I had, I really had to be my own. I believe people are connecting with that honesty. Little known fact: How To Become A SuperHero is actually the launching pad of a much larger project that is slated to include a clothing line, a Superhero Summit (a conference surrounding the SuperHero Movement, such as feeding the homeless), a real-life-SuperHero magazine and a separate non-profit organization. In addition to several other high-profile charitable activities this year, including HOPE 2011 in San Diego (on Comic-Con weekend), an event at Balboa Stadium in which the author partnered with Feeding America and joined 40 Real Life SuperHeroes to give thousands of pounds of free food to the homeless and needy, coordinating a “Book Signing for Africa,” in which over a thousand books were donated, building a children’s library in Malawi, Africa, Michael has also helped raise thousands of dollars for AIDS Research and Patient Care via activities like running two marathons in Hawaii for APLA and white-water rafting. What qualifies Sage Michael to offer instruction to others seeking to become real life SuperHeroes? Simple—his life has been full of transcendent adventures and hands-on service to others that goes above and beyond what the average mortal tends to do. Not even the great Stan Lee could have created someone who, in the same lifetime, has helped orphans in Malaysia; served in the Navy for four years; stopped rapes and assaults in progress (seeing the perpetrators brought to justice); helped train personal protection K9′s to protect families; used micro-finance loans so 3rd-world families could improve their lives; founded a volunteer center and food bank; hand-delivered food, toys and medical supplies to villages in Mexico; and risked his life time-and-again to save others. Holy Renaissance man, Batman! Sage Michael has also run over a thousand miles to raise money for AIDS research; helped students get into college; acted as a consultant to The Pentagon/US Department of Defense and other renowned organizations; been beat up, shot at and trapped in a notorious crack alley in South Central in pursuit of a known felon; scaled a hotel in Los Angeles with his bare hands; gone shark diving, rock climbing, paragliding, soaring and skydiving for various charities; found homes for women and children living on the street and helped a family in India triumph against police corruption.